I love the start of a new academic year. You arrive to it like a traveller post night flight, sleepless from the Sunday insomnia, slightly dazed and confused and anxious. Yet once through the passport control style routine of the first hour, you emerge into this new country; suddenly full with the rush and promise of it all. This year our school doubled in size – another year group and another set of staff. This alone brought with it a particular adrenaline rush. Staff inset itself was full of excitement as new staff began to find their feet and get ready for the realities of their new job, whilst us old-timers beamed as we felt the joy of having recruited new teammates. It’s not just been the new rush of it all that has brought me happiness this week, but also the chance to reflect on the properties that make a great school. In my experiences visiting other schools, (which I haven’t yet finished blogging about), I have explained how much I believe ethos contributes to a great school. Leading my first inset (introducing our new teaching and learning policy) and my first Faculty meeting this week demonstrated to me how important it is to have a teaching staff who buy into this. Building from scratch, we have been able to pick teachers who believe in what we were about and this was so clear to me in our first couple of days. During my inset – which in some schools can often feel a hostile experience, with teachers shuffling about, resistant to input, just wanting to get to their classroom and ‘get on with it’ – I looked around to be faced by a sea of smiling faces, teachers who were keen to get involved, who wanted to support the policy and contribute to the ongoing discussion. I used Berger’s Austin’s Butterfly video as a prompt for group discussions how we would ensure a high expectations culture within our classrooms and what it meant for our teaching and learning mindset, we then looked at some clips from Teach Like a Champion to open up more debate about strategies we use within the classroom, before finishing on details about the coaching system we are establishing. There was definitely more I could have done by using a longer space of time and making more use of the excellent strategies our teachers already have in place; yet I felt that everyone had my back, which meant that we left with positive outcomes and left me even more motivated to make the next session better. Following on from the session, I sent around an email about the coaching system and the replies to this were also full of positivity and engagement. With this kind of attitude in place, I can’t see how we won’t live by our ethos of always aiming higher for ourselves and our pupils. I lead the Faculty of English and Languages, which includes MFL and Classics. At our first meeting we shared our curriculum plans, our first units of work and what we would be doing in our first lessons. We began to explore the links between our subjects and the possible connections in terms of grammar teaching, recitation of poetry and the driving of language learning through literature. We came up with aspirations for the year, including the potential for whole school events and also shared our positive experiences of the year before. I don’t think we stopped talking once during the whole hour and I genuinely mean WE: the ideas and comments bounced rhythmically around. By the end of the meeting, there was a real buzz from being able to chat excitedly about our subjects and think about ways to keep this alive in a science specialist school. It made me realise how important it is to take that time in meetings to discuss and share your love for your subject. On Wednesday our new Year 7s arrived, swamped in their giant uniforms, wide eyed and full of anticipation of the life they will lead with us over the next 7 years. Arriving before them was paperwork and data which wanted to tell us who they were and what their future should be, but in their faces I could only see the phenomenal potential for greatness they all have. It is such an honour to be part of a child’s life in this way and on that first day you see that real need in all of them to be ‘good’; to learn; to work hard; to succeed. It makes the whole “don’t smile before Christmas” message seem completely ridiculous, how can you not smile when faced with so much genuine will from pupils to be the best they can be? 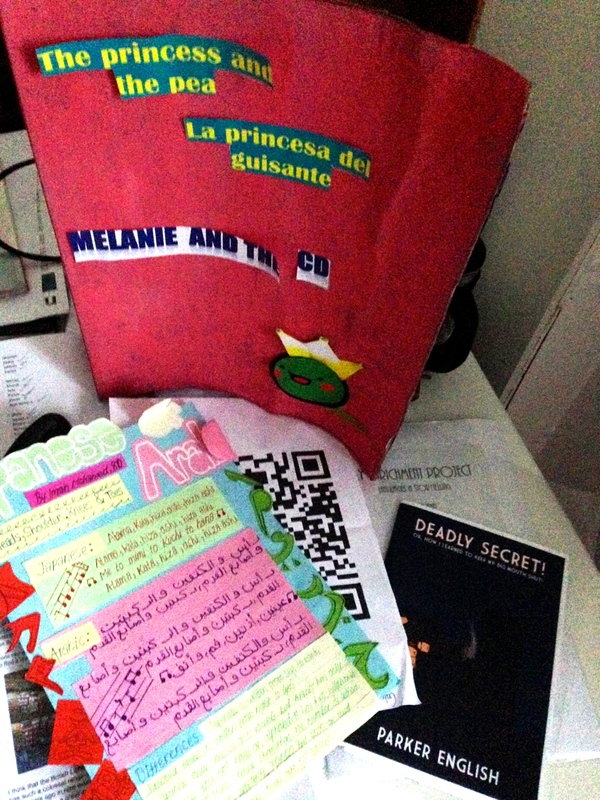 It was a wonderful first day with the year group. But today. Today was it. Our Year 8s returned and seeing the two years together and begin engaging with various projects and tasks, I was overwhelmed with optimism for the future of our school. Year 8 returned full of chatter and stories of their holidays, curiously watchful of the new smaller versions of themselves and our new teachers. No longer the youngest of the school, no longer our only pupils. My first encounter with them was hearing a happy shout out of my name in greeting at the tube station. On the walk to school, we shared holiday stories and considered the implications of the new year group – oh and they asked me when they could hand in their enrichment projects. Yes, voluntarily offered up work without having to be prompted. The rest of the day, I bumped into them leafing through books in the library, and enthusiastically gathering together their work from the previous year into portfolios to help them identify their targets for this year. Popping into the form room (on request from the pupils) of the group had been working on their Languages and Storytelling Enrichment project over the summer, I was presented with armfuls of stories, detailed models and technological wonders. I am genuinely excited about marking them. 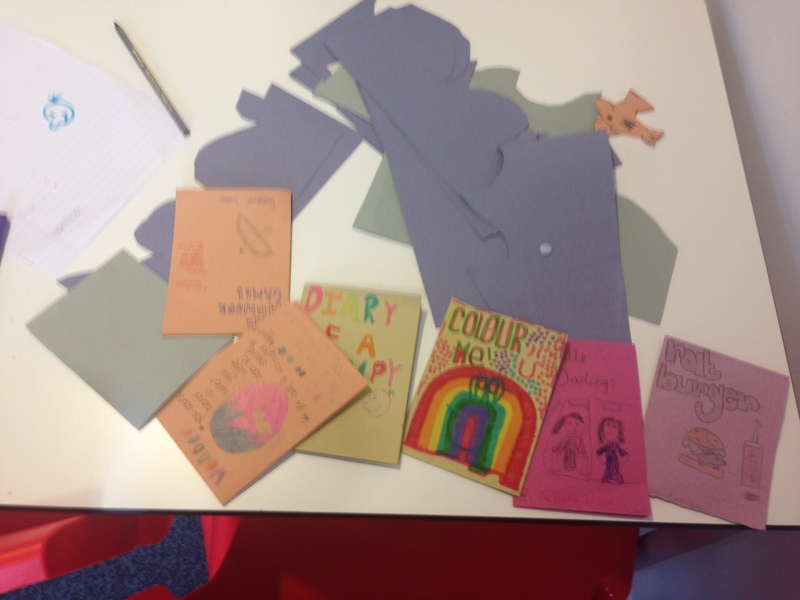 Meanwhile Year 7 were working on two English based projects for much of the day. 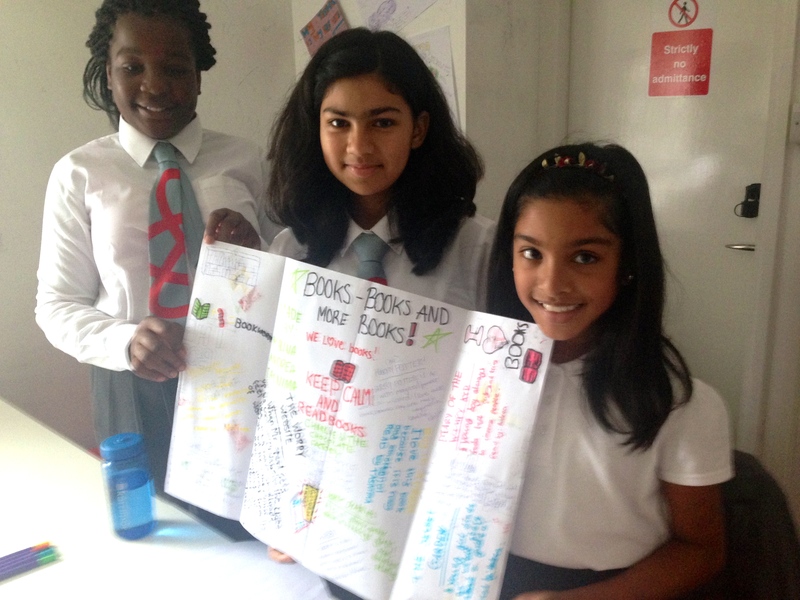 In the first their form tutors shared their experiences of reading with the form; their ‘Journey Through Books’ which I have blogged about here. 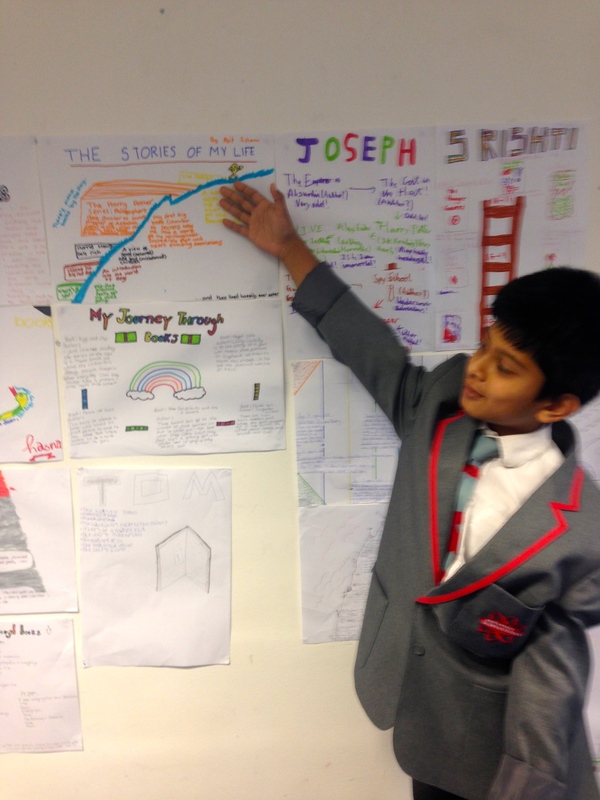 Each form group were then given the chance to create their own journey(s) through books. One of the new form tutors, smiling from ear to ear, told me that she had spent hours “just talking about books” with her form; “we got carried away”. I felt my heart leap with glee. Coming into the classroom, pupils eagerly showed me their work and the inventive approaches they had taken to display their journeys. Their second project was to research the language and cultural histories of their form group and present their findings. In the classrooms, I stumbled across groups of pupils translating 4 or 5 different languages; watched them directing mini films and using their phones to research the history of the different cultures within the class. At lunch time, on the green, a group of pupils surrounded me to discuss: how fantastic books are; the difference between literacy and literature; how we could be the best school in London and how excited they were to start all their different lessons. At the end of the day, pupils and teachers staggered out wearily but grinning from ear to ear full of anticipation for tomorrow; a whole school trip to UCL for a lecture on evolution from Professor Chris Stringer and a tour around the Natural History Museum!! It is weeks like this that remind me how lucky I am to be a teacher and what great places schools can be. I hope that when I have a tough day, when the work piles up and it feels like it’s not worth it, this post will stand as an eternal reminder that actually it really is. Unashamed, rank envy here. I want to teach in your school. Happy new year! This entry was posted on September 4, 2014 by ragazzainglese in Education (general), Reading.